The Undergraduate Symposium is the UO’s annual celebration of undergraduate research and creative scholarship. Students from every academic discipline can submit to present their research or creative work to members of UO’s community of scholars. 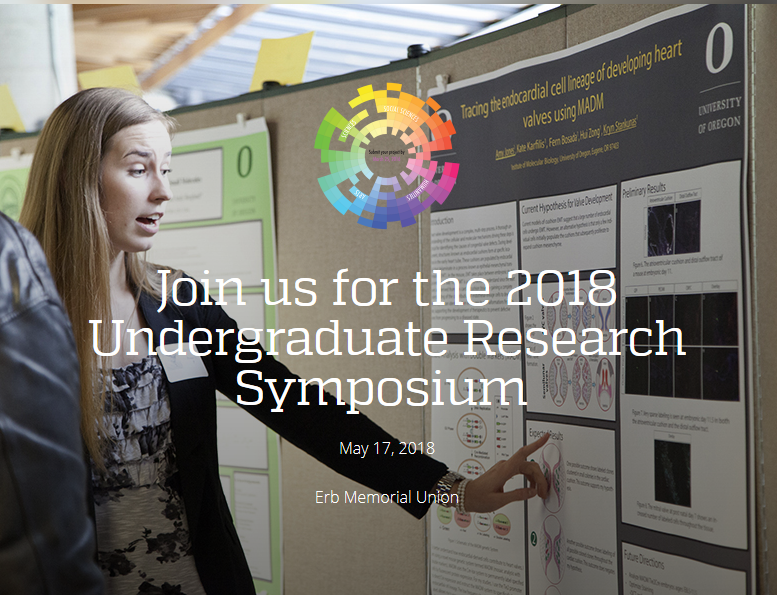 Abstracts for student presentations at the 2018 event are due by 11:59 pm on March 16 and are submitted via the Undergraduate Research Symposium website (http://undergradsymposium.uoregon.edu/). Questions about submissions should be directed to ugresearch@uoregon.edu. The 2018 Symposium will take place on Thursday, May 17 and will include a reception and awards ceremony at 5:00 pm. Information sessions will take place on Thursday, January 11 from 3:00-4:00 pm & Monday, March 5 from 4:00-5:00 pm in the GSH Learning Commons.